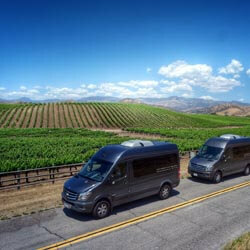 Classic Wine Tours of Santa Barbara will host your excursion into wine country utilizing a modern Mercedes Benz Sprinter van with a tall roof and large viewing windows. We choose only wineries we have tasted at ourselves and have vetted for quality and excellent service. Your hosts are Kevin & Sherene Donoghue who are both Level 1 Sommeliers from the Court of Master Sommeliers. With their broad knowledge of wine, and the Santa Barbara wine community, you are assured to have a memorable and educational experience. Your day in wine country will include four winery visits with all of the tasting fees included, our very nice picnic lunch, and door to door service in the Mercedes Benz Sprinter van. Our lunch is a very nice artisan style sandwich on focaccia bread served with gourmet stuffed olives, roasted nuts, kettle chips, and a brownie dessert. Lunch is served on real plates with cloth napkins and includes regular or sparkling bottled water for an elevated wine country experience.